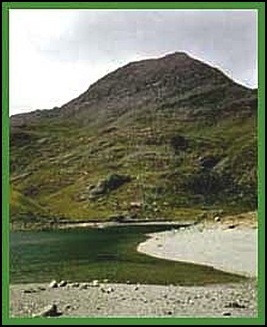 Climbing Mount Snowdon in North Wales by the Pyg Track and Llanberis Path. I wish I had kept a proper record of my walks and rambles. In putting all the walk details together I have had to rely, very much, on dates on photos and Anne’s memory and the memory of others. One of Larry’s cousins does it so much better. According to Larry every walk is recorded in minute detail with date, route, walking companions, names of pubs visited and flora and fauna seen. If it was all put together on a website I am sure it would make my effort seem poor. I am now facing this lack of data when writing about excursions on Snowdon. I know I have climbed it 10 times, but it might actually be 11, and I have certainly done Crib Goch four times and the Snowdon Horseshoe once and, although the Horseshoe is a hard walk, I would certainly like to do it again. During our family holiday visits to Snowdonia, which we took in the late 80’s and early 90’s, our yearning to get up high gradually increased. Although we had had many pleasant walks at lower levels there was always the urge to climb another mountain. I had climbed Snowdon three times before these family holidays, including twice with Anne, and was keen to share this enjoyment with Greg and Ian. The first excursion during this time I was just accompanied by Greg. We had decided to go to the top via the Miner’s Track. However, like so often in Snowdonia, it rained. 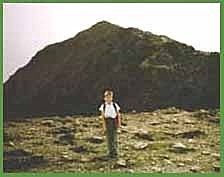 In fact it was really bad and when we reached Llyn Glaslyn I was uneasy about climbing up to reach the Pyg Track, the Zig Zags and the top. The rocks were getting very greasy and I felt conditions would get increasingly more dangerous and there was always another day, or holiday, so we turned round and walked back to the car at Pen-y-pass. As it was, the weather brightened up as we reached the causeway across Llyn Llydaw and we wished we had carried on. Hindsight is a wonderful thing but on reflection it is always better to be cautious in the mountains than foolhardy. It was the following August (1988) when all four of us reached the top together. 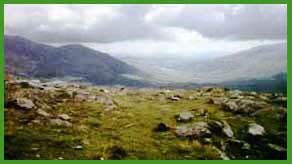 We walked up the Llanberis Path, the one that goes almost the same route as the Snowdon Mountain Railway. Compared with the Pyg and Miner’s Tracks I consider this to be a very boring route. Ok it is longer, and you actually have to ascend more; Llanberis the starting point is lower than the starting points for the Pyg and Miner’s Tracks. However, the scenery changes you enjoy on this route are minimal. 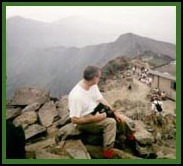 Certainly the walk /scenery I don’t consider to be in anyway as spectacular as from the inside of the Snowdon Horseshoe. However, it is good for riding down on a cycle, which Greg and one of his friends did a few years ago after cycling up the Miner’s track and carrying their machines from Llyn Glaslyn to the top of Snowdon. But I digress. This is supposed to be about getting up Snowdon the easy way! 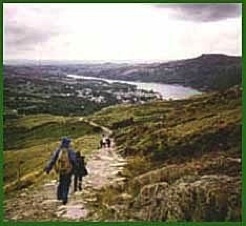 At that time we did this Llanberis Path "walk" the Halfway House Café existed and I remember all of us enjoying lemon squash there on our way up. Unfortunately this haven for the mountain walker is no more. Now the only "oasis" is the café on the top of Snowdon. Needless to say when we reached the top it was crowded with walkers and the less energetic that prefer to use the convenience of the Railway to obtain the majestic views from the top of Snowdon. This part of the Pyg Track between the Pass of Pigs and the beginning of the Snowdon Zig Zags is probably the best part of the walk. The path, certainly in the early stages, is not too steep but the views are spectacular. 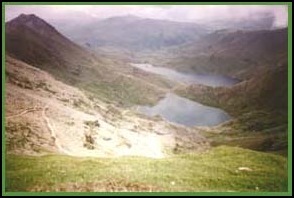 On the right is the Crib Goch Ridge, below you can see the causeway over Llyn Llydaw and beyond that the twin peaks of Y Lliwedd. The path continues upwards and soon you are rewarded by the view of Snowdon in all it’s majesty as it rises from the shore of Llyn Glaslyn, which is located at its base. Just writing this encourages me to revisit this splendour. Zig Zags, has been improved. This part is no longer as dangerous as it used to be, but care is still essential. Most walkers will stop on the Zig Zags bends on the pretext of enjoying the views but more likely than not it is to take a short break. 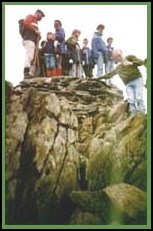 The reaching of the "Rock", Bwlch Glas, where the Zig Zags meet the ridge that leads to the top is therefore welcome. 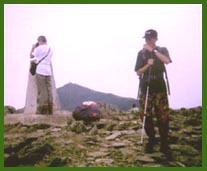 However, once on this ridge you will be confronted by the railway track and other walkers who will have walked up Snowdon via the Llanberis Path or Snowdon Ranger Route. From here it’s a short, but still steepish, ascent to the Railway Station, the Café and the top, which, on a hot summer’s day, is usually teeming with walkers and railway passengers. I have been on the top when the railway is not running and the Café is closed and, although it will usually be cold, it is a far more pleasant experience. What always amazes me though is the clothing and footwear of some of the "walkers". Many times when I have walked down, usually via the Miner’s Track, I’ve passed females walking in high heel shoes that Anne would find it difficult to walk in even around town. And some of the clothes would be more appropriate on the dance floor than the highest mountain in England and Wales. I am amazed that more accidents do not occur on Snowdon. park at Pen-y-pass and go up via the Pyg Track and down via the "Miner’s". However, the Car Park was full so we motored down to Llanberis, parked the car and were lucky enough to get a Snowdon Sherpa Bus immediately, which took us up the Llanberis Pass, and were soon at the beginning of the Pyg Track. The day was beautiful, bright sunshine and it was pleasantly warm. It was a super walk and we reached the top in 1 hour and 55 minutes. As usual it was crowded and so having said "hallo" to the summit we walked the ¼ of a mile or so to Garnedd Ugain (Crib-y-Ddysgl), the second highest of the Welsh 3000s so we could all say we had climbed two mountains that day. From there we walked back to Llanberis via the Llanberis Path and I was certainly sad to see the Halfway House was no longer there. A Snowdon lemon squash would have gone down a treat.